There are several ways how to trade head and shoulders pattern. You can use basic rules or some version of advanced trading rules. You can use them for classic (bearish) and also inverse (bullish) head and shoulder chart pattern trading strategy. The basic entry rule for trade based on this reversal chart pattern is to enter short trade immediately after the breakdown of the neckline. You have to set the stop-loss above the neckline. As with all breakout strategies this is little bit risky. The aggressive type of entry is based on timing during the creation of the right shoulder. If you see volume confirmation and price stops around the highs of the left shoulder, you can enter short-sell position. You should set the stop-loss level for every opened position accordingly. You can place it above the right shoulder or the head to avoid a situation where a trading setup based on this pattern will fail. A typical target for such trade is value, which is lower in the same span from neckline as is the top of head above the neckline. You have also to consider a time frame for a possible trade based on shoulders and head stock chart pattern. 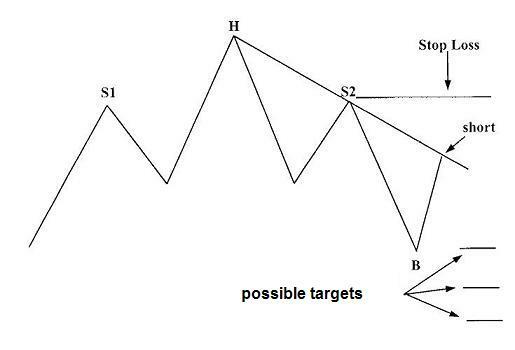 If you find it on five-minute chart, then you can expect that target can be achieved within several hours on the same day. 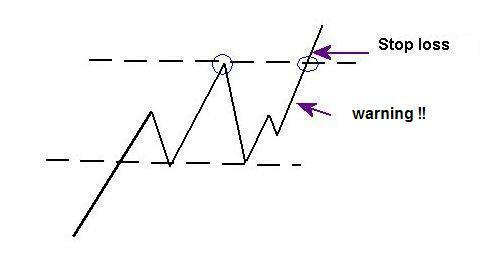 If you see this pattern on a daily chart, then you have to hold position for several days before achieving the target value.